Paytm Add Money Promocode-Paytm Today New Offer Launched This Offer is A Paytm Add Money Promocode Get-Rs.20 cashback per transaction Minimum Earn Rs.100 this promocode use only Paytm Kyc & Mini KYC Done.But KYC not done You can not available this offer. How to ‘Paytm Add Money Promocode’ use. 1. )first Download And Open Paytm App. 2. )Go to Add Money option. 3. )Now Add Money Minimum Rs.2000 and More Add Money. 4. )And Apply this Promocode- “BONUS “Apply. 5.) Successful Add Money Done. 6. 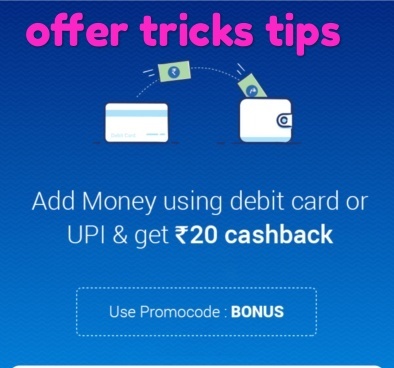 )Go to Paytm Passbook And Cash back Rs.20 Instant . 1. )Offer Available Only KYC User And Mini KYC User. 2. )Promocode Apply Done Add money Successful You Can Earn Per Transaction Rs.20 Cash back . 3. )This Offer Use Per Month 5 Tim’s . 4. )Cash back Receive instantly .